Click on the picture for Interactive First Picture Spanish, or scroll down and click on the topic links to hear the words by themselves. 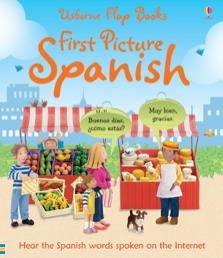 Delightful scenes with speech bubbles and natural dialogue introduce young children to the Spanish language in a natural way. With flaps to lift to reveal the English translation of the simple Spanish phrases.